Separate bok choy leaves from stems. Cut leaves into 2-inch pieces; cut stems into 1/4-inch slices. Set aside. Spray large nonstick skillet with nonstick cooking spray. Heat over medium-high heat until hot. Add carrots, bell pepper and bok choy stems; cook and stir 3 minutes. Add water; increase heat to high. Break noodles into small pieces; add to water. Discard seasoning packet from soup mix or reserve for another use. Cover; cook 3 minutes. Add bok choy leaves, bean sprouts and corn. Stir in teriyaki baste and glaze. 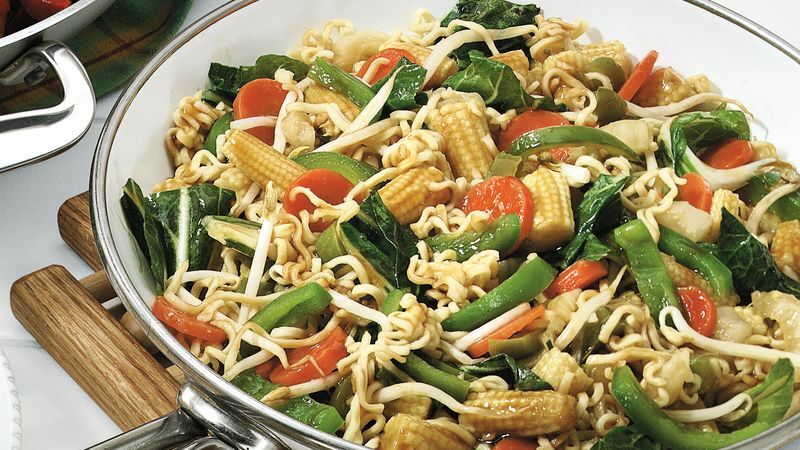 Cook and stir 1 to 2 minutes or until vegetables are crisp-tender and mixture is thoroughly heated. Use thick teriyaki baste and glaze for this recipe; it provides rich flavor and a nice sheen. Bok choy's silvery-green leaves contain vitamin A and C, and calcium. Bok choy is a member of the cruciferous family of vegetables. Sliced cucumbers with a splash of rice vinegar and a sprinkle of toasted sesame seeds make a nice accompaniment to this stir-fry. For dessert, serve nectarine halves drizzled with lemon yogurt and a sprinkle of crushed ginger cookies.